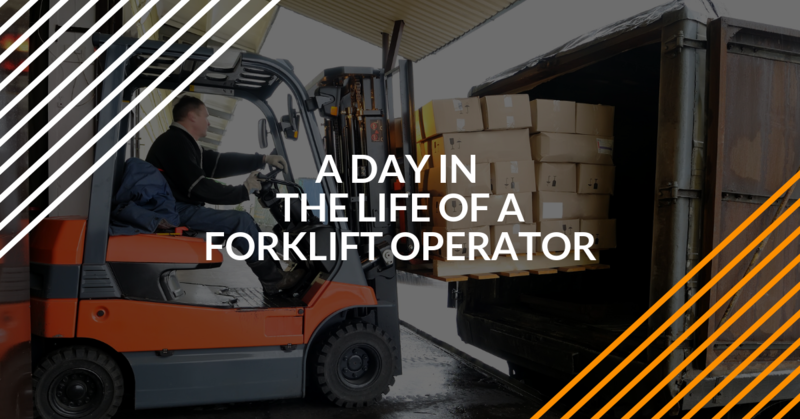 What does a typical day in the life of a forklift operator look like? It all depends on assigned duties and the workplace. There’s nothing “typical” about a forklift operator in a frozen food distribution warehouse and a rough terrain lift driver on a construction site. Those two jobs are about as different as possible. A day in the life of one forklift operator isn’t even in the same ballpark (or dockyard) as a day in the life of another. OSHA. If you operate a forklift in the United States, you’re subject to the U.S. Occupational Safety & Health Administration (OSHA). This agency of the U.S. Department of Labor establishes safety rules, conducts accident investigations, and has the power to impose fines and penalties on any person or company that’s not compliant with the latest safety standards. Common sense forklift operation. Whether you operate an outdoor forklift, a pallet jack order picker, or an indoor man lift, the same tried-and-true principles of sound, common sense forklift operation are the same. In order to avoid accidents and injuries, forklift operators need the basic skills and knowledge to perform efficiently and safely. It all starts with common sense behind the wheel. Depending on a forklift driver’s particular role, day-to-day duties can vary drastically. It’s hard to pigeonhole forklift jobs into a one size fits all description. Pre-shift inspection. Every forklift driver starts the day with a quick yet thorough pre-inspection. Are there any loose hoses? Are the brakes working as intended? Do all safety accessories (backup alarms, turn signals, etc.) work fine? Before work starts for a forklift driver, there’s already a little bit of work to do! General job duties. Here’s where the day in the life of a forklift operator gets interesting. Ask five different forklift drivers what they do on a daily basis, and you’re likely to get five different answers. Indoor warehouse forklift drivers typically unload trucks, move pallets onto elevated shelves, and perform other cargo management tasks. Most of the day is spent in climate-controlled conditions, and there is no concern about the weather. The one glaring exception is for refrigerated warehouses; some of these facilities are kept well below zero degrees, so forklift drivers are required to wear hats, gloves, coats, and other apparel to keep warm. Outdoor forklift drivers work in dockyards, ports, lumber yards, construction sites, and more. The type of work done by outdoor forklift drivers is dictated by the working environment. Construction site drivers may be required to transport material, while dock workers might spend some time on ships and other vehicles to unload cargo. Avoiding hazards. Through all the activity required to get the job done, forklift operators are required to put safety first at all times behind the wheel. For warehouse workers, this means blind spots around corners, pedestrian traffic, poor lighting, and more. Outdoor forklift operators (for example, a construction site) have different hazards to worry about: the weather, other vehicles, uneven terrain, and other factors. Punch in, punch out – typical work hours. Most lift operators work 8-hour shifts, though overtime is required during peak activity times. The Best Day to Get Your Employees Certified and Complaint? Yesterday, Today & Tomorrow! We offer three training packages to help your entire forklift fleet to become compliant. Our affordable prices and online, study-anywhere convenience make us the preferred choice for today’s busy companies. Forget expensive training seminars. Don’t worry about inconvenient safety sessions. We bring OSHA-approved, 100% compliant training right to your employees. Train a Trainer. Interested in having a Certified Forklift Safety Expert at your company? Sign up with our Train a Trainer course today! Training Kit. With this course, we’ll explain everything you need to know about safe, efficient forklift operation. This is one of our most popular training classes. Bundle Package. This package offers the Train a Trainer and Training Kit courses for an exclusive discounted rate! Don’t go another day without making sure your forklift fleet is certified. You’ll not only avoid accidents and injuries, but your employees will also promote and foster an overall safer working environment. That’s hard to put a price tag on! If you have any questions about our forklift training packages, or if you’d like to speak with our safety training experts, please call (888) 278-8896.